Treated burlap bags meet US military spec CID-A-A-52141 class A. They're resistant to moisture, mildew, UV, critters & insects. 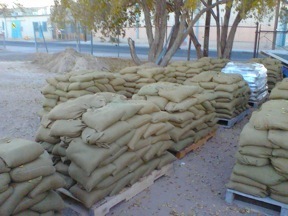 Olive green, their filled size (30-35 lbs) when laid flat is about 18"L x 12" W x 4-5" H. Bags are filled with masonry sand and secured with wire ties.